Location/ Directions: From I-70, take right 72 N (exit 54). 2 miles to Selma Road. Turn left on Selma Road. Bear to the right onto South Limestone Street. The Courtyard will be on the left. About Hotel: 6-Floors, 120-Rooms, Interior Corridors, Air-conditioned, This is a non-smoking hotel, Connecting rooms are available, Shower/Tub combination, Hair dryer, Chair, Alarm Clock, Desk with ergonomic chair, Iron and ironing board, Room service, Coffee maker, Speakerphone with voice-mail, Free High speed Internet, 32in flat screen Cable/satellite TV, Radio, Sofabed, Whirlpool, Balcony Guest rooms, Complimentary on-site parking, Pets welcome (fee), Housekeeping service daily, Full business center, Fitness center Onsite. Railroad View: Excellent View! Most every room in this hotel will offer a railroad view. No rooms face the tracks directly, the track is located on the south side of the building. High floor rooms are recommended to keep above automobiles in the parking lot and some trees. Either side of the hotel should offer a good view. I had a room on the east side which I was satisfied with. The trains move slowly through town and do not blow their horns. The hotel is also very sound proof, which makes listening for trains very difficult. You really need to have your TV, air/heater off to have a chance to hear the passing trains. Windows do not open. Odd numbered rooms face east, even numbered rooms face west. Room numbers ending in the 20's will be closest to the railroad. Room numbers ending with a "25" have a window that faces the tracks directly. Rooms that end with a "24" or "26" have a balcony facing the railroad. For those not satisfied watching trains from the hotel, there is a pedestrian walkway along the railroad track. This pathway provides a legal place to watch & photograph trains. Railroads past Hotel: Norfolk Southern Railway. (Former Conrail / Penn Central / New York Central Railroad). Hotel is near milepost 183. Expect 10-12 trains daily past the hotel. Notes: If your rooms is quiet, you may hear a distant train horn alerting you to an approaching train. During my stay, the hotel has a security guard paroling the parking lot at night. Not sure what the reason for that is, is this not a safe area? I arrived the hotel at 9:45pm, and departed at 12:30pm the next day - I had no issues during my stay. 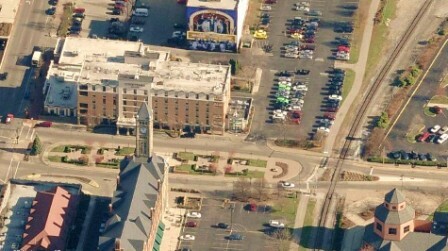 Photo Comment: Aerial photo shows Courtyard (building with white roof), and the single track railroad South Fountain Avenue near the hotel. Photos from room # 623: My view from the room looked eastward. Trains were easy to see. Nighttime there is enough light to view and video passing trains (don't look too hard, there is no train in the night photo). The daytime view is very good. Some trees are present, but they do not block the view completely. This is a single track railroad that sees 10-12 Norfolk Southern freight trains daily. During my 15-hour stay, only 5 trains past, then a track-work program started at 10:30am just west of the hotel. Bottom Photo: A pedestrian walkway along the railroad tracks is a great place to view and photograph passing trains. In this photo you can you can see the hotel, walkway, and single track railroad. This photo was taken around 12noon looking west down the railroad. Trains do not blow their horns in town and proceed at slow speed. Location/ Directions: I-70 to exit 52B to 68 North, Go 1 1/2 miles and exit Rt 4 and 40. 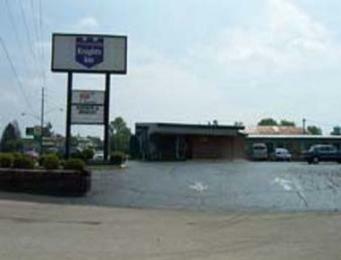 Motel on Right hand side. 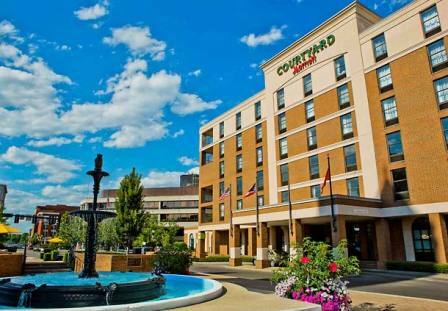 About Hotel: 1-Floors, 39-Rooms, Exterior Corridors, Free Continental Breakfast, Pets Allowed (fee), Truck/Bus Parking, Ice Machine, Vending Machines. Railroad View: Expect a Poor to Fair View. Railroad runs behind the motel, you may have to step outside the door to see trains. No windows face the railroad directly. Trees and brush also foul what could be a good view. Railroads past Hotel: Norfolk Southern Railway (Former Conrail / Penn Central / New York Central Railroad). We are not sure of train frequency on this line. 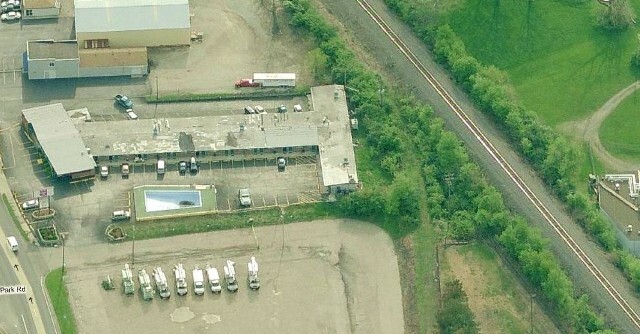 Photo Comment: The aerial photo shows the Knights Inn, the single track railroad can be seen to the right with trees and heavy brush which may foul much of the railroad view.